ATN (American Technologies Network) is best known for their night vision devices, but also offers military style day use binoculars. ATN's Omega series is Mil-Spec rugged and many include reticle rangefinders. 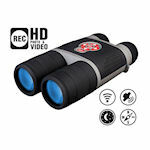 ATN Smart HD Binoculars are the first real step towards "Star Wars" binoculars. Day/night digital vision, digital recording, live video streaming via wifi, GPS geo-tagging, image stabilization, and excellent depth perception are some of the features provided by their obsidian core.